You’d think (as they hold commercial detecting events most weekends) Central Searchers would wish to be seen as responsible. But look what they say about their upcoming 3-day Bank Holiday Special at Twywell/Slipton, Northants ……. But that’s not all. We have dubbed it a crassfest for a separate reason. It seems they have a “Rule” that applies to ALL their events: Items found by any member/non member/guest can be retained by the member/non member/guest as long as its value is no more than £2,000. Translated, they are telling customers that although all non-Treasure finds are owned by the landowner they have swung a deal that says their customers will own 100% of any such finds that are worth up to £2,000! 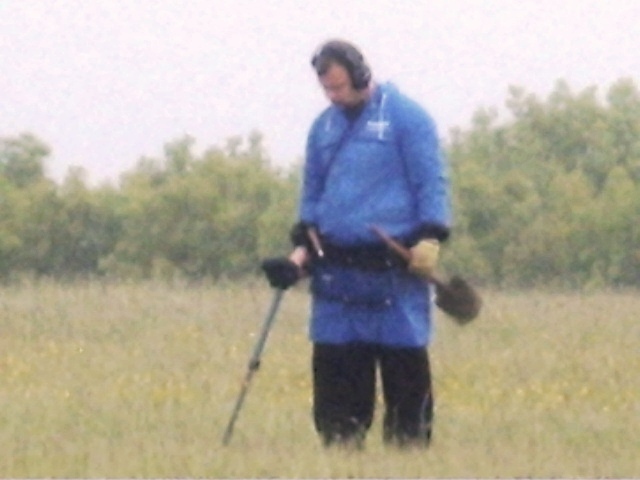 We thought the event held by the Colchester Metal Detecting Club was unseemly enough – see Lucrative Heroism – but this, negotiating to own the first £2,000 of finds, far out-grubs that – and they do the same deal every week it seems, which means thousands of detectorists have attended events on that basis. So what think you dear reader? Does it seem like a Rule designed for a gathering of people whose main interest is “history” – people that British archaeology should flatter and get itself in “partnership” with? Or does it seem like a Rule designed to attract primarily acquisitive people, out to grab what they can get? Is it fair or unfair to call such an event a crassfest that brings profound shame upon our country? You choose. UPDATE Wednesday 27 October 2010: It seems that those who run Central Searchers continue to regard “ridge and furrow ” as fair game for them to exploit for money despite knowing it’s wrong. This time they are exercising their selfless beneficence in Bythorn, Cambridgeshire. The thirty acres of British history they have arranged for their paying customers to detect upon today include, in their own self-condemnatory words, “20 acres of ridge and furrow pasture that runs to the back of Bythorn village up to the earthworks of an old manor house“. UPDATE Tuesday 2 February 2011: And still they persist. This time they’ve targeted 200 acres of ridge and furrow pasture at Keyston, Cambridgeshire, that English Heritage say is of national and perhaps international importance. I detect at some of the CS events and I find them well run and occasionally I even find something interesting. I have no interest whatsoever in the value and most of my better finds have been donated to museums. The £2000 threshhold applies to treasure and non treasure alike and is designed to make it absolutely clear what the relationship between the finder and landowner is. You know as well as we do that no private agreement can override the law of the land so the Treasure Act still applies in full. If you were really that interested you would be out there arranging for the whole of the UK to be subjected to a controlled archeological excavation before development, fertiliser, livestock or vigorous modern agriculture trashes all the small metal finds. As it is your comments just sound like sour grapes. Indeed, it makes the relationship crystal clear. It asserts that apart from Treasure items the landowner normally gets approximately nothing and the detectorists normally gets approximately everything and that the landowner has sold the community’s history and they have bought it. Interesting comments I just wish you had spoken to us first then you would fully understand how we work, but obviously you couldnt be bothered. Nice photo to that was taken yesterday in the pouring rain, (Day one of the Crassfest) but just for your information that detectorist was on a field that has actually been ploughed in the past. Again never bothered to check the actual “FACTS”. By the way thanks for all the publicity. You give the impression you believe we have written something factually incorrect. But you have failed to say what. We have to say that if you believe our article has provided welcome publicity that doesn’t say much for the sort of customers you are wishing to attract. I am one of those customers that CS attracted and find your comment about the people CS attracts quite insulting. This means that I can detect safely, legally and with the consent of the landowner. Without CS and people like them, I think that more people would resort to detecting using the light of the moon. Most people just want a good day detecting for the love of it. Unfortunately, detecting “safely, legally and with the consent of the landowner” is neither enough nor the point. Well suprise suprise you removed my last polite posting. SO WHAT IS THE POINT OR IS IT JUST YOUR POINT ?????? I think the point that they may be referring to is ‘choosing to behave ethically’. detecting “safely, legally and with the consent of the landowner” is neither enough nor the point. So No laws were broken Well Done Central Seachers on doing something Legal and within the law of the United Kingdom . Any other snide comments welcome ! Never mind history, heritage, metal detecting. What sort of person are you to judge others that you have never met and know nothing about. What right do you have to speak in public about others in that way? I find your comments both offensive and ignorant and yet you try and take some high morale ground and talk of ethics. I am a law abiding citizen that as never done anything to anyone. I recently played a part in saving someones life and each month assist in a community service for free in my time even though i work 60 hours a week very week. You claim to serve the preservation of history yet your actions betray that you serve only your own bigoted view. I have attended CS digs for nearly a year now and met people from all walks of life (up standing people who contribute much to this country Great Britain). Professionals such as police, scientist, teachers, paramedics, soldiers, tradesmen to the man that empties your bins. I was wondering what type of people you mean CS will attract. People I speak to on the digs are, believe it or not also interested in the heritage and history of this county, even if they are armed with a dangerous weapon called a metal detector. My point that you say I don’t get is to highlight the positive side and not just your negative views. Then stop trying to stir up trouble for all the law abiding metal detectorist over here in the UK. Well. That didn’t take long to come out. I’ve suspended the acceptance of metal detectorist comments on this topic for the present. 1. The law is not always the ‘ethical position’. Otherwise laws would never be changed. Why do governments legislate? Metal-detecting was legal in Ireland. Now it isn’t. Does that mean that it was uncriticisable, and morally correct, before it was banned, but perfectly criticisable and morally suspect now? Read Animal Farm. 2. I’m not sure how eager those professionals you mention would be if other people, untrained, had a go at their job. I’m not an archaelogist, but I assume that they’re learning something in college for all those years. Many of you may not fully realise the harm that you are doing. Two wrongs don’t make a right – pulling items ‘dead’ from the soil, digging through the archaeology to get at the metal, or discarding ‘worthless’ items isn’t fully responsible for the death of the archaeological record, but it’s eating the twitching body as if it were carrion. I’ve put my own name above this. I made the last comment. No one else here did. I am the one that should be attacked. No Gordon, I’m more deeply implicated (and older!) and must take the brunt of that threat. I’ve had many from his likeminded friends over the years and don’t dismiss any of them. You’ve explained it admirably. Ethics, the one concept that remains completely inaccessible to most metal detectorists and the one thing that gives us all the logical and moral right in the world to express contempt for much of what they do and don’t (along with most archaeologists in private and any thinking, informed person, notwithstanding the endless bleating about legality and “we must save it all (for whom??) before it rots”). Poor PAS and CBA, they must be tearing each other’s hair out! If the leading rally provider (and their customers, ex officio) haven’t yet understood that causing no damage to the record at their events is totally and utterly paramount at all times, what has thirteen years of “outreach” been all about? Incidentally, if anyone cares to let us know who “Big Mick” is please email us at info@heritageaction.co.uk as we’re anxious to contact him (we are quite sure most people well understand how unwelcome threats are to people with families) – although we won’t hold our breath – after all, the nighthawking survey stood by the phone after a similar request, and hardly need have bothered, misplaced loyalty and clannishness being the order of the day.